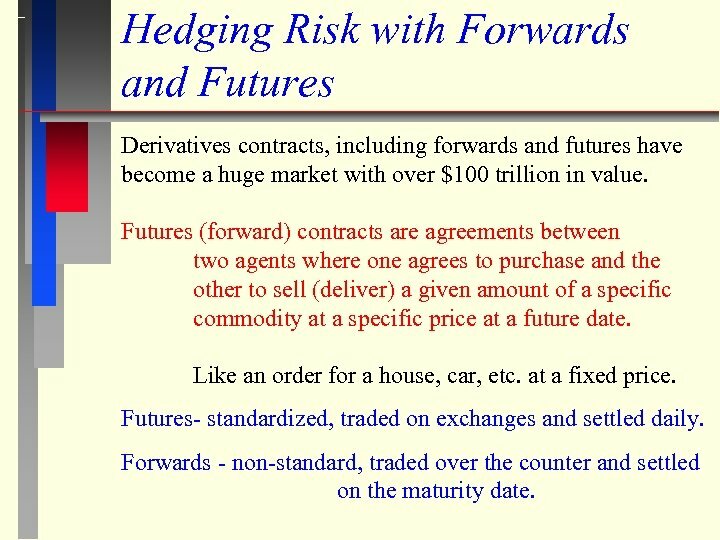 Hedging Risk with Forwards and Futures Derivatives contracts, including forwards and futures have become a huge market with over $100 trillion in value. Futures (forward) contracts are agreements between two agents where one agrees to purchase and the other to sell (deliver) a given amount of a specific commodity at a specific price at a future date. Like an order for a house, car, etc. at a fixed price. Futures- standardized, traded on exchanges and settled daily. Forwards - non-standard, traded over the counter and settled on the maturity date. 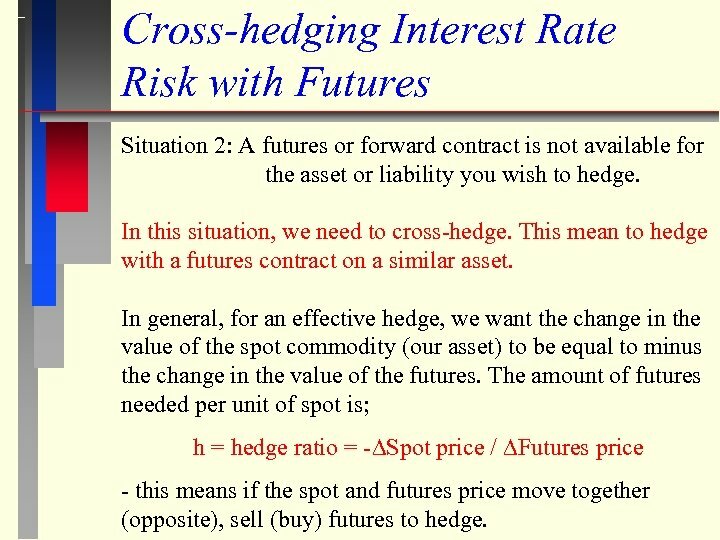 Cross-hedging Interest Rate Risk with Futures Situation 2: A futures or forward contract is not available for the asset or liability you wish to hedge. In this situation, we need to cross-hedge. 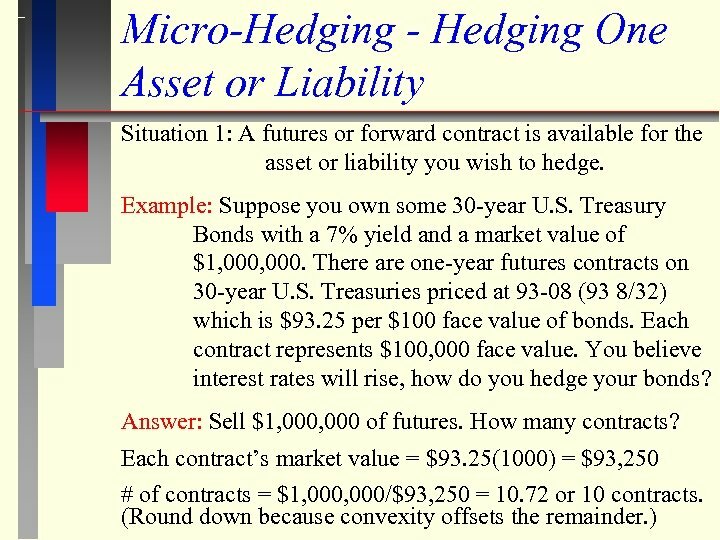 This mean to hedge with a futures contract on a similar asset. In general, for an effective hedge, we want the change in the value of the spot commodity (our asset) to be equal to minus the change in the value of the futures. 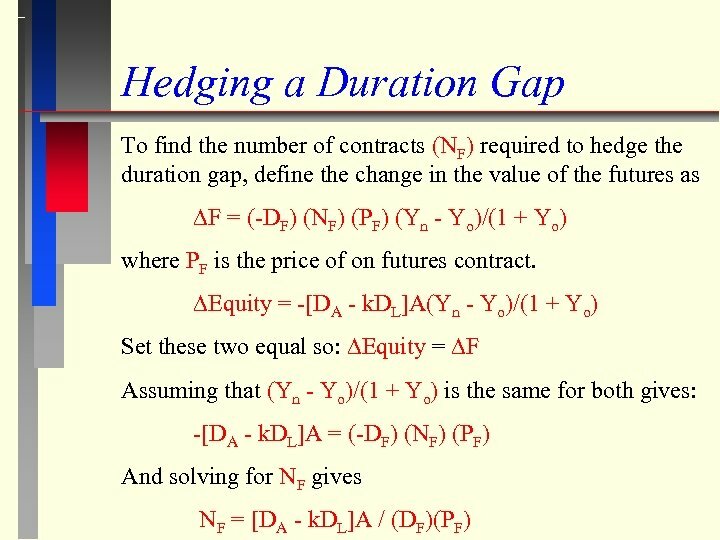 The amount of futures needed per unit of spot is; h = hedge ratio = - Spot price / Futures price - this means if the spot and futures price move together (opposite), sell (buy) futures to hedge. Hedging Your Corporate Bond with Treasury Futures You can estimate your bond’s price change as (1) and the price change of the Treasury futures bond as (2) Pc, (PT) Durc, (Dur. T) Yoc, (Yo. T) Ync , (Yo. 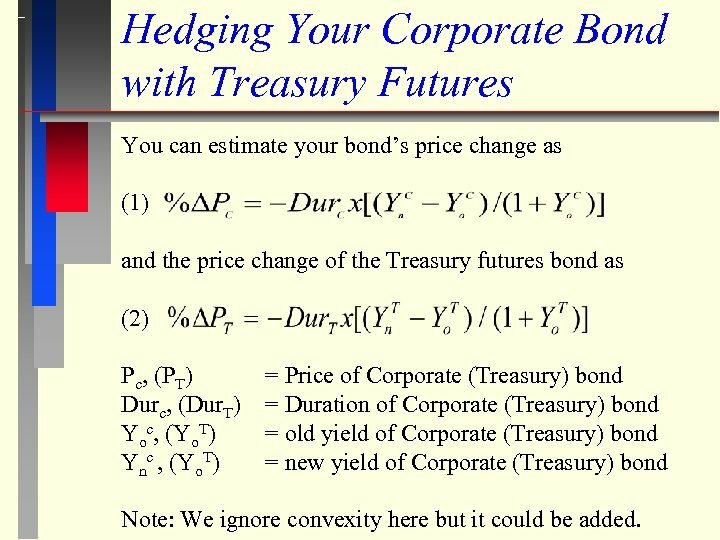 T) = Price of Corporate (Treasury) bond = Duration of Corporate (Treasury) bond = old yield of Corporate (Treasury) bond = new yield of Corporate (Treasury) bond Note: We ignore convexity here but it could be added. 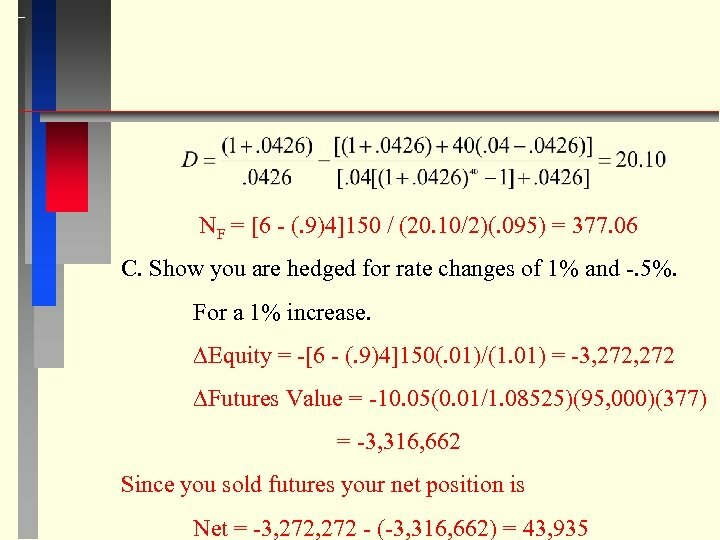 Hedge Ratio To get the hedge ratio, divide equation (1) by (2) to get where and h = the units (dollars) of futures to be sold per unit (dollar) of spot. It assumes a parallel shift in yield curve. 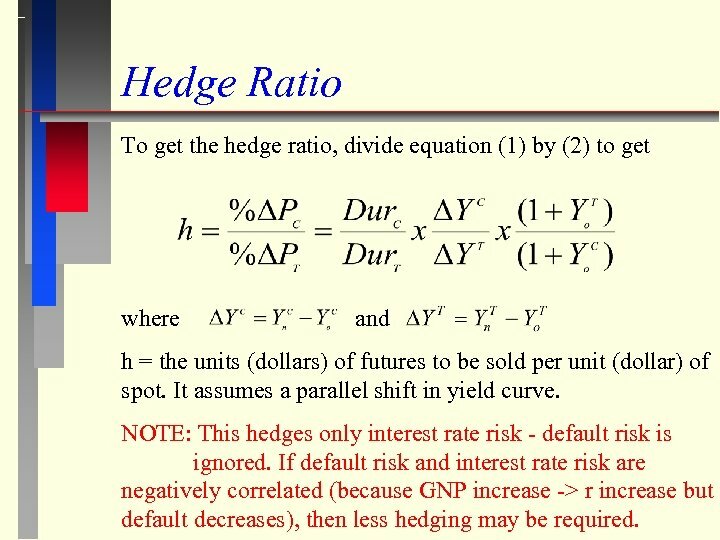 NOTE: This hedges only interest rate risk - default risk is ignored. If default risk and interest rate risk are negatively correlated (because GNP increase -> r increase but default decreases), then less hedging may be required. 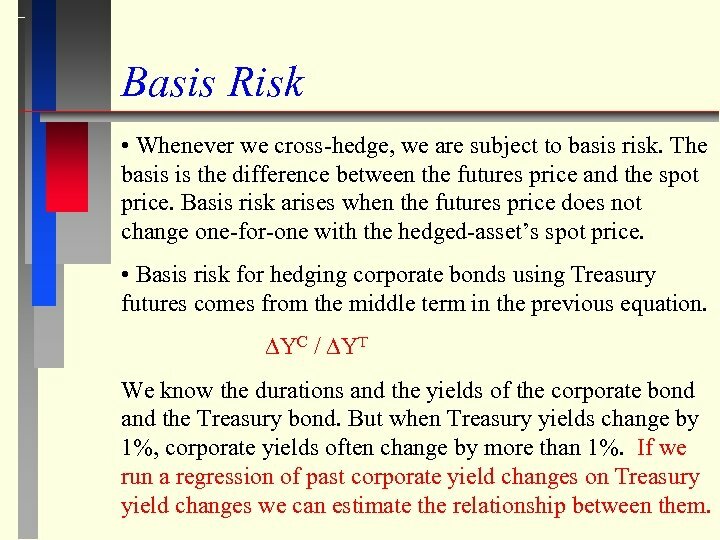 Basis Risk • Whenever we cross-hedge, we are subject to basis risk. The basis is the difference between the futures price and the spot price. Basis risk arises when the futures price does not change one-for-one with the hedged-asset’s spot price. 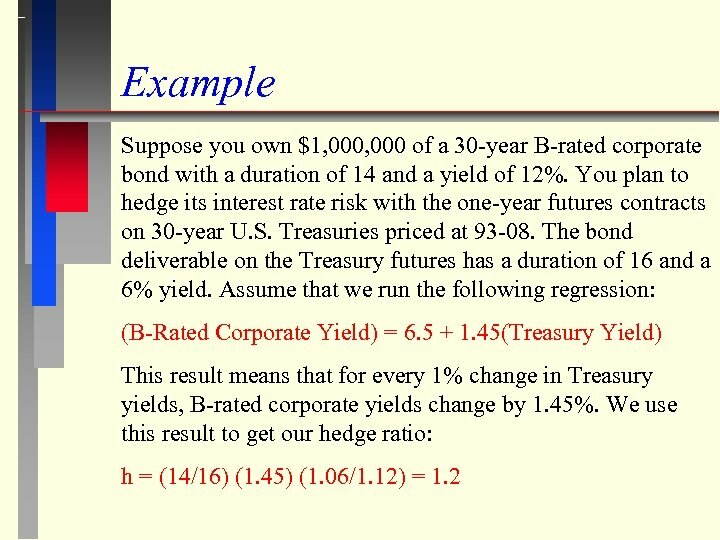 • Basis risk for hedging corporate bonds using Treasury futures comes from the middle term in the previous equation. YC / YT We know the durations and the yields of the corporate bond and the Treasury bond. But when Treasury yields change by 1%, corporate yields often change by more than 1%. 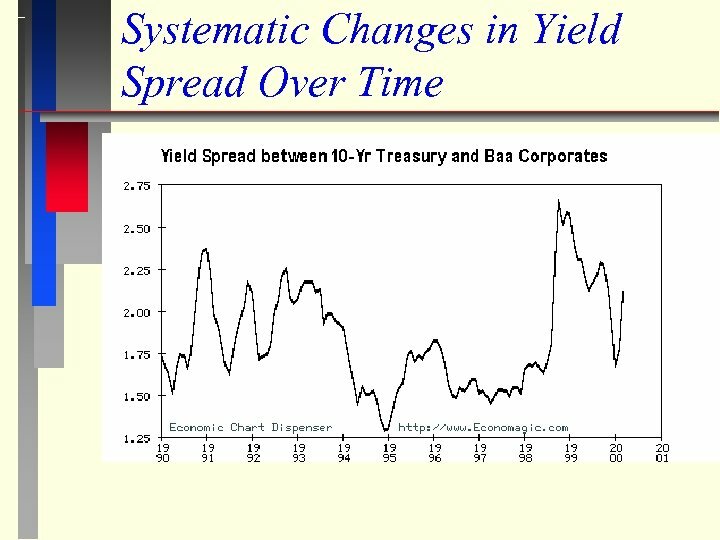 If we run a regression of past corporate yield changes on Treasury yield changes we can estimate the relationship between them. 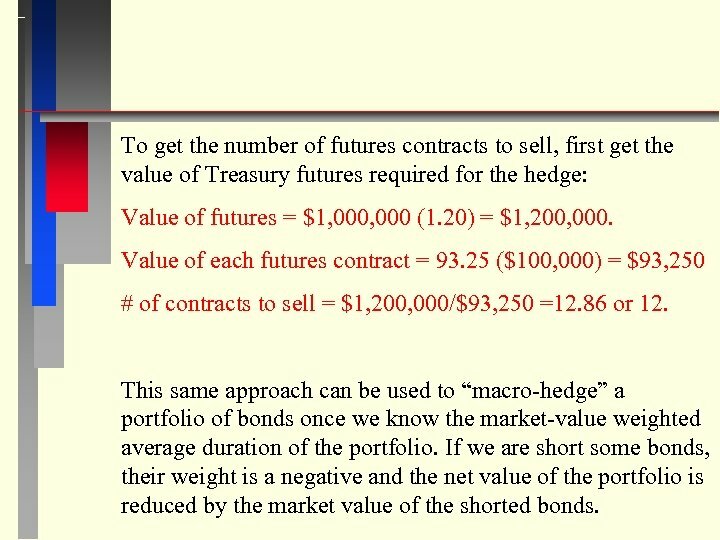 To get the number of futures contracts to sell, first get the value of Treasury futures required for the hedge: Value of futures = $1, 000 (1. 20) = $1, 200, 000. Value of each futures contract = 93. 25 ($100, 000) = $93, 250 # of contracts to sell = $1, 200, 000/$93, 250 =12. 86 or 12. This same approach can be used to “macro-hedge” a portfolio of bonds once we know the market-value weighted average duration of the portfolio. If we are short some bonds, their weight is a negative and the net value of the portfolio is reduced by the market value of the shorted bonds. 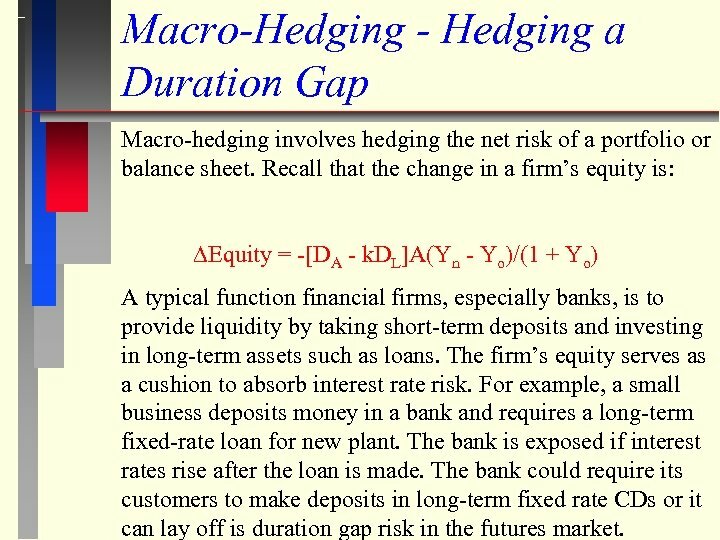 Macro-Hedging - Hedging a Duration Gap Macro-hedging involves hedging the net risk of a portfolio or balance sheet. Recall that the change in a firm’s equity is: Equity = -[DA - k. DL]A(Yn - Yo)/(1 + Yo) A typical function financial firms, especially banks, is to provide liquidity by taking short-term deposits and investing in long-term assets such as loans. The firm’s equity serves as a cushion to absorb interest rate risk. For example, a small business deposits money in a bank and requires a long-term fixed-rate loan for new plant. The bank is exposed if interest rates rise after the loan is made. The bank could require its customers to make deposits in long-term fixed rate CDs or it can lay off is duration gap risk in the futures market. For a. 5% decrease. Equity = -[6 - (. 9)4]150(-. 005)/(1. 01) = 1, 636, 363 Futures Value = -10. 05(-0. 005/1. 08525)(95, 000)(377) = 1, 658, 331 Since you sold futures your net position is Net = 1, 636, 363 - (-1, 658, 331) = -21, 967 D. If we use $1, 000 face value Tbills with a price of 98 per 100 face value and. 25 duration. How many contracts? NF = [6 - (. 9)4]150 / (. 25)(. 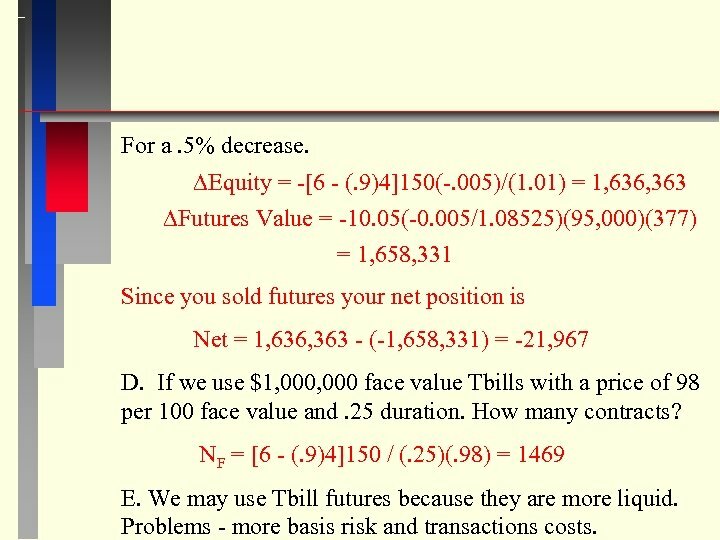 98) = 1469 E. We may use Tbill futures because they are more liquid. Problems - more basis risk and transactions costs. 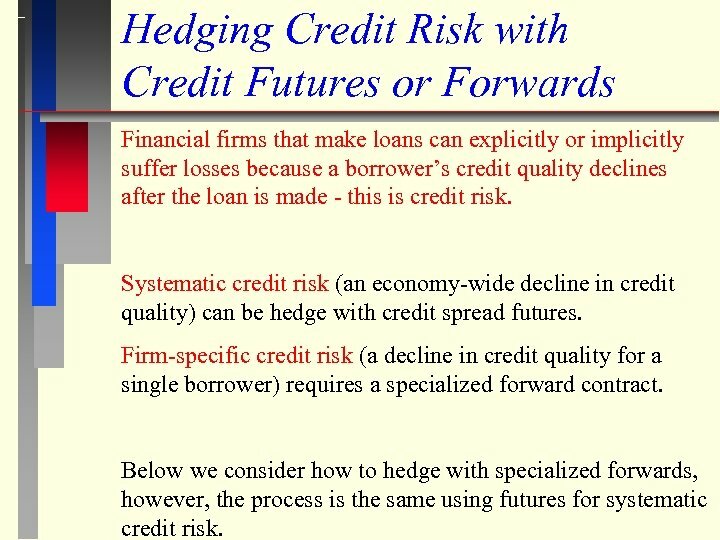 Hedging Credit Risk with Credit Futures or Forwards Financial firms that make loans can explicitly or implicitly suffer losses because a borrower’s credit quality declines after the loan is made - this is credit risk. Systematic credit risk (an economy-wide decline in credit quality) can be hedge with credit spread futures. Firm-specific credit risk (a decline in credit quality for a single borrower) requires a specialized forward contract. Below we consider how to hedge with specialized forwards, however, the process is the same using futures for systematic credit risk. 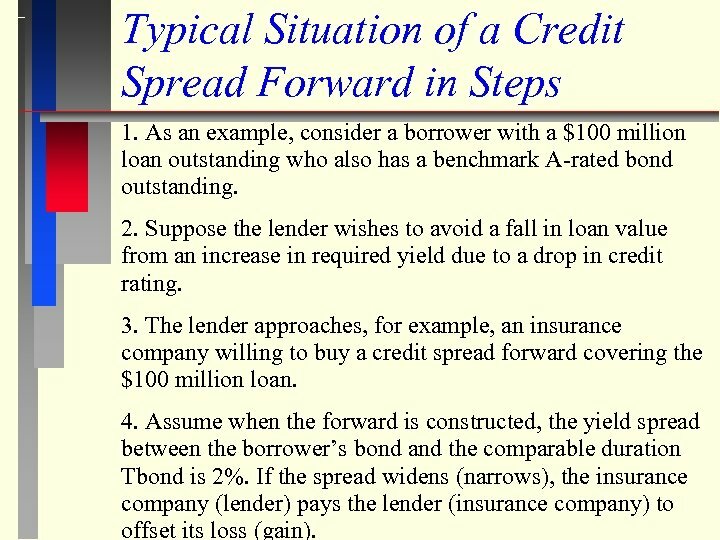 Typical Situation of a Credit Spread Forward in Steps 1. As an example, consider a borrower with a $100 million loan outstanding who also has a benchmark A-rated bond outstanding. 2. Suppose the lender wishes to avoid a fall in loan value from an increase in required yield due to a drop in credit rating. 3. The lender approaches, for example, an insurance company willing to buy a credit spread forward covering the $100 million loan. 4. Assume when the forward is constructed, the yield spread between the borrower’s bond and the comparable duration Tbond is 2%. If the spread widens (narrows), the insurance company (lender) pays the lender (insurance company) to offset its loss (gain). 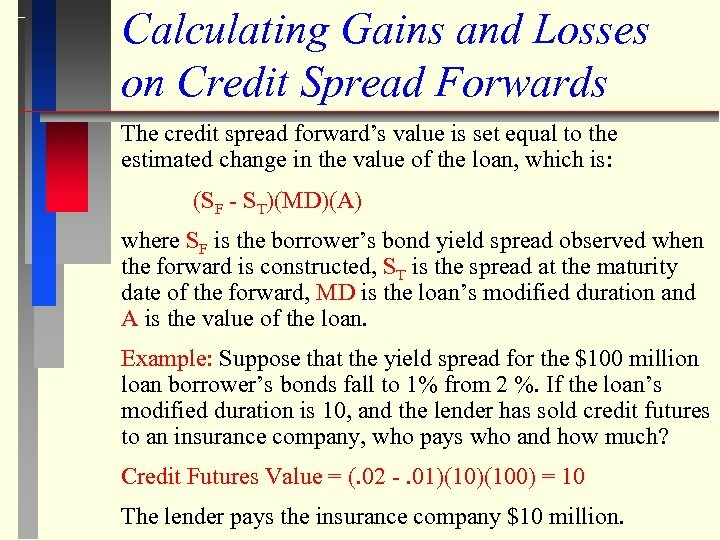 Calculating Gains and Losses on Credit Spread Forwards The credit spread forward’s value is set equal to the estimated change in the value of the loan, which is: (SF - ST)(MD)(A) where SF is the borrower’s bond yield spread observed when the forward is constructed, ST is the spread at the maturity date of the forward, MD is the loan’s modified duration and A is the value of the loan. 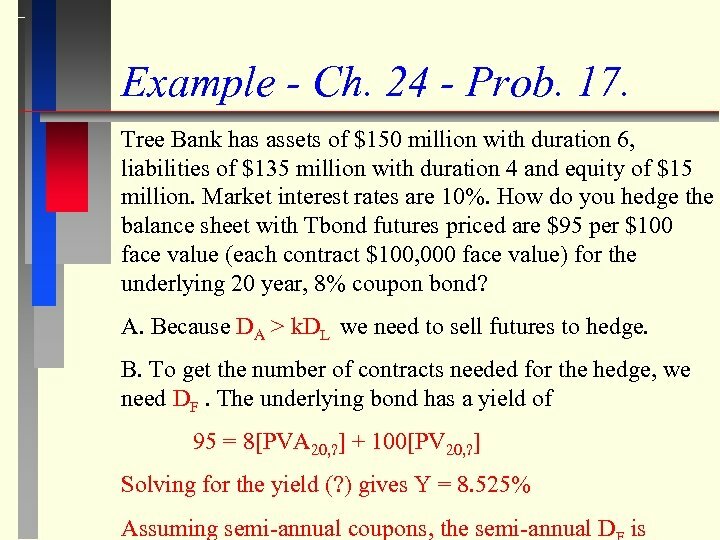 Example: Suppose that the yield spread for the $100 million loan borrower’s bonds fall to 1% from 2 %. If the loan’s modified duration is 10, and the lender has sold credit futures to an insurance company, who pays who and how much? Credit Futures Value = (. 02 -. 01)(100) = 10 The lender pays the insurance company $10 million. Using Catastrophe Futures to Hedge Casualty Risk 1. Suppose you are an insurance company insuring $10 million in home value. 2. 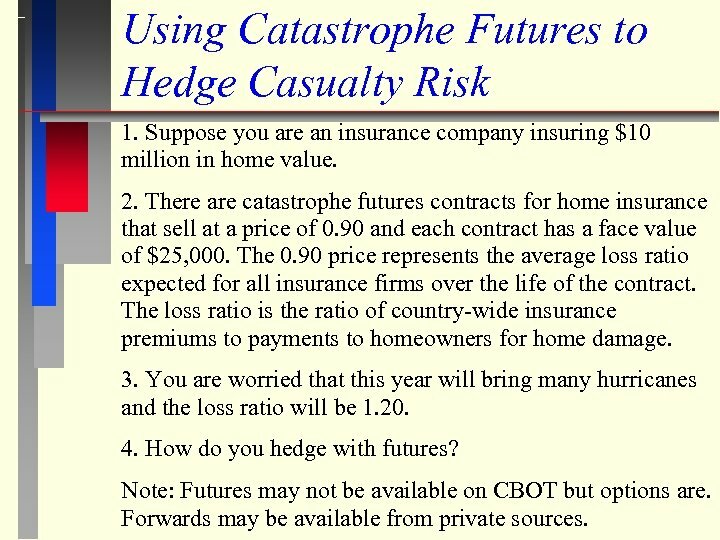 There are catastrophe futures contracts for home insurance that sell at a price of 0. 90 and each contract has a face value of $25, 000. The 0. 90 price represents the average loss ratio expected for all insurance firms over the life of the contract. The loss ratio is the ratio of country-wide insurance premiums to payments to homeowners for home damage. 3. You are worried that this year will bring many hurricanes and the loss ratio will be 1. 20. 4. How do you hedge with futures? Note: Futures may not be available on CBOT but options are. Forwards may be available from private sources. 5. You need to buy catastrophe futures. 6. How many? # contracts = 10, 000/25, 000 = 400 7. What happens if the loss ratio ends up at 1. 20 at the maturity date? Your gain = (1. 20 -. 90)(25, 000)(400) = 3, 000 8. What happens if the loss ratio ends up at 0. 80 at the maturity date? Your lose = (. 80 -. 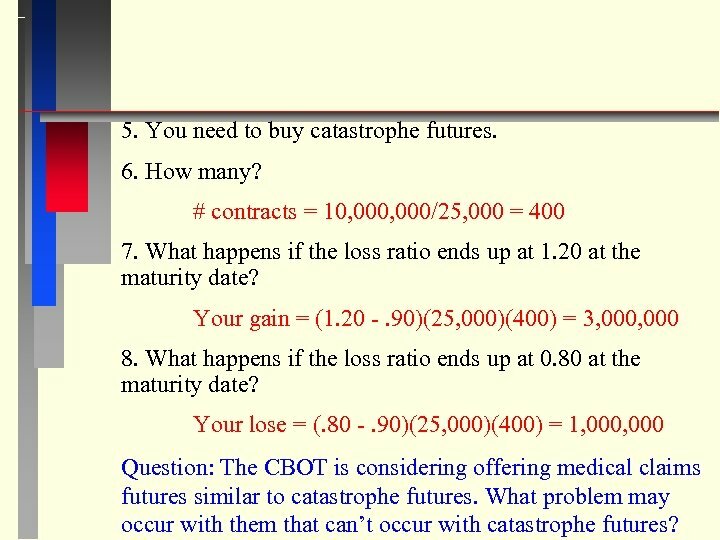 90)(25, 000)(400) = 1, 000 Question: The CBOT is considering offering medical claims futures similar to catastrophe futures. What problem may occur with them that can’t occur with catastrophe futures?